Today is Remembrance Day, also known as Armistice Day. At the eleventh hour on the eleventh day of the eleventh month, we pause for a moment’s silence to remember those who have suffered and died in war. There are very few of us whose lives have not been affected in some way by the wars of the 20th and 21st century. Either in this generation or an earlier one, there will be an event which has had consequences for you as an individual. It could have been your ancestor’s death or injury in battle, but it could equally well be related to mental and emotional trauma, forced displacement or emigration. One way or another, war and its consequences have probably shaped your life. 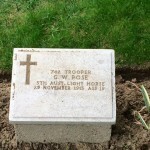 A few weeks ago, I visited Gallipoli with my husband, who was keen to visit the grave of his great-uncle George. Dawn over the Dardenelles was beautiful. What awaited us was beautiful too – but in a profoundly heartbreaking way. 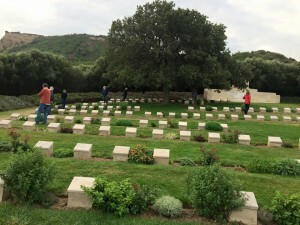 The Commonwealth War Graves Commission does a magnificent job of maintaining military cemeteries around the world, and Gallipoli is no exception. 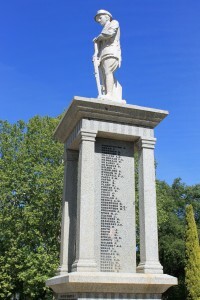 The WW1 Pictorial Honour Roll of Queenslanders gave us all the information we needed about George Rose, including the grave location in Ari Burnu Cemetery, a photograph and a physical description. George William Rose was 5″9′, with a fair complexion and gray eyes. He was a country boy, so he joined the 5th Light Horse. George arrived with the reinforcements in November 1915. He lasted just nine days. He really was only nineteen, just like the song says. Those heroes that shed their blood and lost their lives… You are now lying in the soil of a friendly country. Therefore rest in peace. There is no difference between the Johnnies and the Mehmets to us where they lie side by side here in this country of ours… You, the mothers who sent their sons from faraway countries, wipe away your tears; your sons are now lying in our bosom and are in peace. After having lost their lives on this land they have become our sons as well. Yes, these are deeply moving words, but consider them in context…. The casualties were appalling – hardly surprising when you look at the hilly terrain and the almost impenetrable scrub. Furthermore, the total of 8,709 Australian deaths does not include the dreadful toll taken by diseases like typhoid and dysentery. Turkish losses, on the other hand, are almost beyond comprehension. Estimates are close to 70,000, with some sources saying over 200,000 when illness is included. 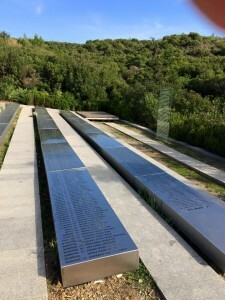 The Turkish dead were buried in mass graves, marked only by endless lists of names. On Remembrance Day, we should remember them all, allies and enemies in so many armed conflicts – and the families they left behind.